Make yourself at home in one of the 70 air-conditioned rooms featuring refrigerators and microwaves. Complimentary wireless Internet access keeps you connected, and satellite programming is available for your entertainment. Private bathrooms have complimentary toiletries and hair dryers. Conveniences include desks and complimentary newspapers, as well as phones with free local calls. This hotel has 3 floors in 1 building and offers wheelchair access. Amenities include designated smoking areas. Take advantage of recreation opportunities including an outdoor pool and a fitness center. Additional features at this hotel include complimentary wireless Internet access and a television in a common area. Guests can get around on the complimentary shuttle, which operates within 5.00 mi. You can enjoy a meal at The Chuckanut Lobby Bar serving the guests of TownePlace Suites by Marriott Bellingham, or stop in at the snack bar/deli. A complimentary buffet breakfast is served daily. Bellingham's Newest Hotel Near the Airport Welcome to the area’s newest full-service hotel, the Holiday Inn & Suites Bellingham. 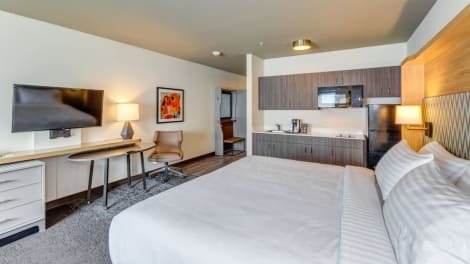 Conveniently located next to the Bellingham International Airport, this upscale hotel is close to Downtown Bellingham, Bellis Fair Mall, and Western Washington University. 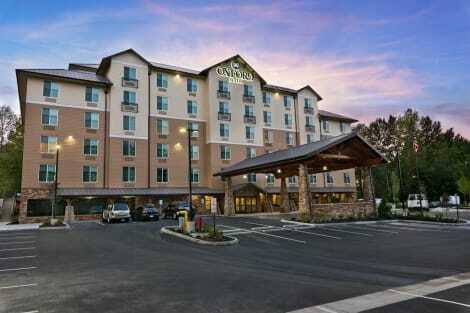 Just off I-5, this modern and innovative hotel offers a comfortable-casual, full-service restaurant,northwater. Locally sourced and sustainable, northwater's menu highlights the best of the Pacific Northwest. Room service is always encouraged.Guests flying to or from the adjacent airport have access to our park and fly options and airport shuttle. Not just an airport hotel, we are 3 miles away from the Guide Meridian near Whatcom Community College and Cordata station. Serving Whatcom County, guests can also discover the Mount Baker Theater, Mt. Baker Ski Area and the Fairhaven Historic District.During your stay, enjoy our luxurious suites, on-site fitness center featuring the latest in exercise equipment, or relax in our steam room or sauna and finish with a dip in our refreshing indoor saline pool. We are your “go to” place when it comes to meeting space and conference events. We offer 7,800 square feet of flexible meeting space serving events both large and small with boardrooms available. Come experience all that the Holiday Inn and Suites-Bellingham has to offer! Make yourself at home in one of the 81 air-conditioned rooms featuring refrigerators and microwaves. Your pillowtop bed comes with premium bedding. Wired and wireless Internet access is complimentary, while 37-inch flat-screen televisions with cable programming provide entertainment. Private bathrooms with shower/tub combinations feature complimentary toiletries and hair dryers. Stop by the hotel's restaurant, Oxford Bistro, for dinner, or grab snacks at the coffee shop/café. Mingle with other guests at the complimentary reception, held daily. Wrap up your day with a drink at the bar/lounge. A complimentary full breakfast is served daily from 6 AM to 9 AM. lastminute.com has a fantastic range of hotels in Bellingham, with everything from cheap hotels to luxurious five star accommodation available. We like to live up to our last minute name so remember you can book any one of our excellent Bellingham hotels up until midnight and stay the same night.